Raising chickens for meat is easy to do. Economical and efficient, it takes only 10 weeks to raise a broiler (meat chicken) from chick to the dinner table. Hormone-free, organic chicken is in high demand, better for your family than factory birds, and raising your own chickens for meat puts you as close to your food source as you can get. No matter whether you want to raise chickens for meat for your own personal use or for business purposes, check your local laws and restrictions. It’s illegal to raise farm animals within city limits in some places and it’s forbidden by homeowner’s associations in others. If you’re planning on beginning a chicken business, make sure you acquire any permits before you get started. Once you’re legal, prepare your property. Build a chicken hutch and a chicken run, buy food and watering supplies, and read up about raising birds for meat. The more you read on the topic, the better luck you’ll have. Certain chicken breeds make excellent layers. Some are great broilers. Other breeds are fine for both purposes and are called dual-purpose birds. When looking for a great meat bird, consider that some birds grow to full size and can be eaten much sooner than other birds. Some meat birds can be cooked within 8 weeks. Cornish Rock and Ixworth are two such breeds. The downfall of breeds such as these is that they have been genetically altered to gain weight so quickly that they cannot possibly live long or healthy lives. Past a certain amount of time, they simply cannot support themselves. Heritage chickens are an excellent option if you’re opposed to modern, hybrid poultry. Heritage birds are classic chicken breeds which are hearty and long-lived but often passed over for rapidly-growing, genetically altered hybrid chickens. Raising heritage chickens for meat may take longer, but you’ll have healthier, longer-lived birds and will also help preserve heritage chicken breeds. Several great-tasting heritage chickens are the Dorking, Buckeye, Rhode Island Red, and the Dominique. Many of these breeds are duel-purpose, meaning that they will also be able to lay eggs before ending up on your dinner table. Clean your chicken’s coop regularly to keep them healthy, feed them a well-balanced died, and vaccinate your flock. Meat chickens eat a great deal of feed and gain weight rapidly. A Cornish cross-breed can be expected to eat 8 lbs of feed for the first 6 weeks. They grow extremely fast and are harvested when they are only 2 months old. As a general idea, a light chicken breed should consume about ¼ lb of feed daily. For a heavier bird, feed them more. In general, a meat chickens are allowed to eat as much as they want because the goal is for the bird to grow rapidly. Water is important too, and chickens drink twice as much as they eat. Keep that waterer full! The exact amount of food your birds will consume varies. In general, provide your chickens with a constant supply of fresh food. Clean the feeder as needed and keep it free from moldy feed, which can contaminate the rest of the feed. Trial and error will teach you how often—and how much—to feed your flock. Broilers grow rapidly, especially in their first weeks of life. 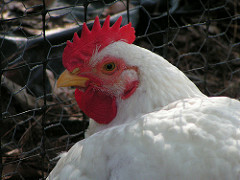 Commercial chicken breeds will reach 5 lbs in approximately 7 weeks. Slower-growing heritage breeds will take about 11 weeks, or longer, to reach the same weight. Raising chickens for meat can be a rewarding hobby, one that will put nutritious food on the table or increase your family’s income if you intend to sell your birds. Know your options, choose the breed that best suits your needs, and care for your chickens well. The rest will fall into place.